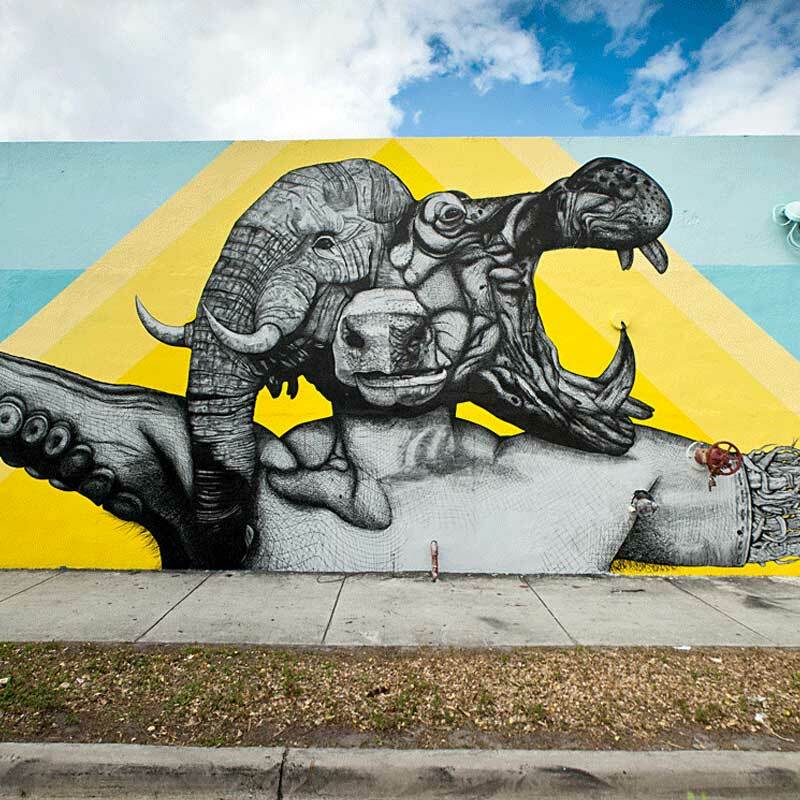 Alexis Diaz is a Puerto Rican painter and urban muralist, known for his chimerical and dreamlike depictions of animals in a state of metamorphosis. 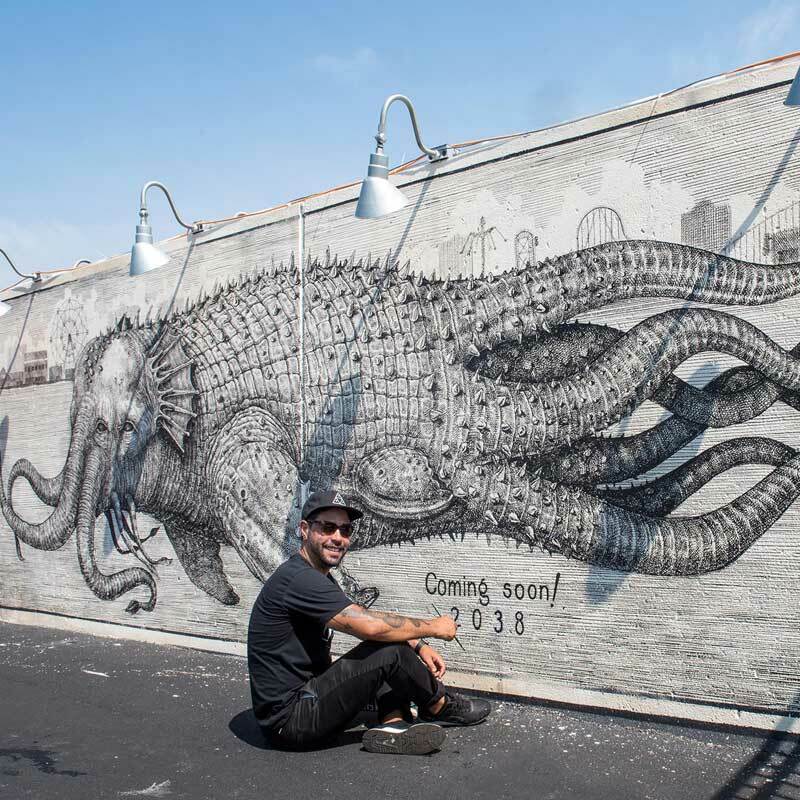 Inhabited mostly by phantasmagorical animals, Alexis Diaz’s captivating murals are characterized by a very detailed technique and line-by-line precision. Diaz’s signature style is the use of tiny black brushstrokes on a white background to render his creatures, making them look like highly-detailed pen-and-ink drawings. These ‘drawings’ stand out all the more for being set against bright teal, blue, and sunset-colored backdrops. He has a preference for wild animals, more specifically those living in the Savannah, which he blends in a fantastical image with creatures from the depths of the ocean, replacing paws with tentacles and wings with hands. 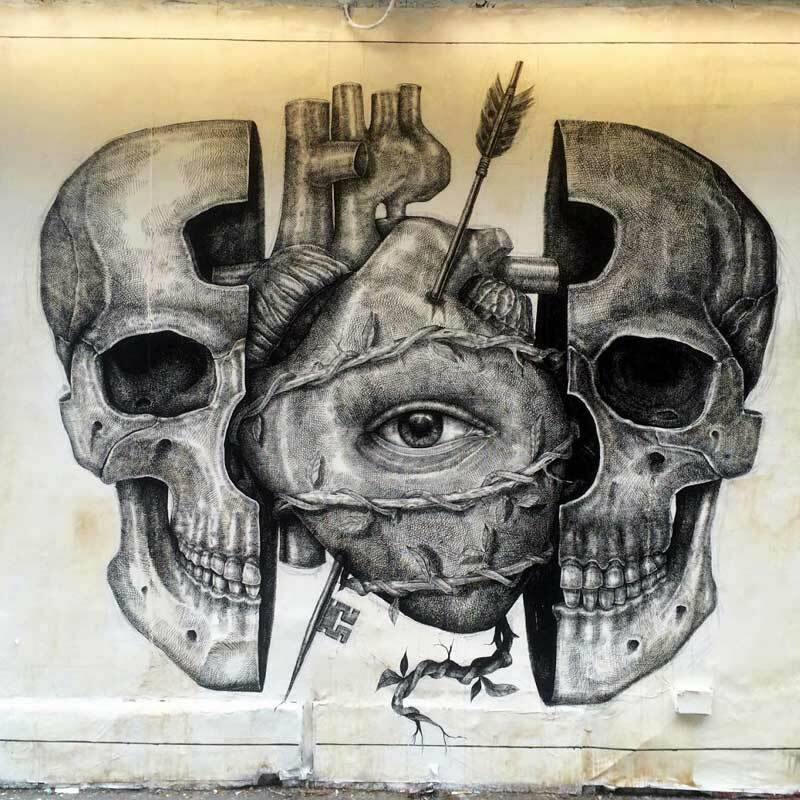 Alexis first began to create murals in 2010, alongside his friend Juan Fernandez a.k.a. JUFE. 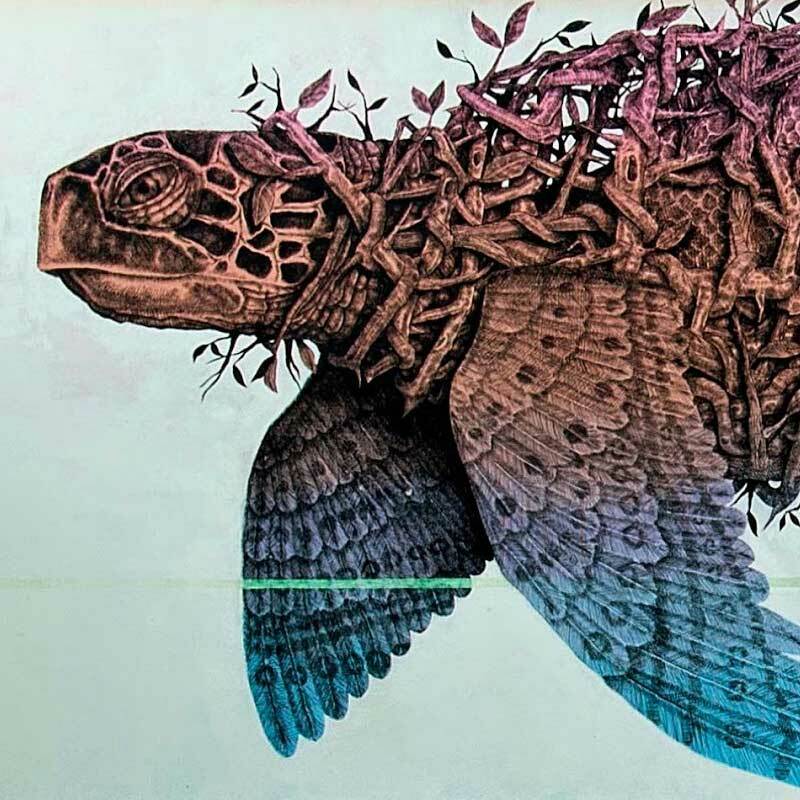 Both artists are known for intricate line detail, splashes of vibrant color and the melding of fantastical animal imagery. The street art scene in Puerto Rico was at the time very limited, only using typical spray cans, and any other mediums were generally either completely overlooked or even frowned upon, so Alexis felt quite restricted. This was until he discovered the work of Keith Haring who was a big inspiration and encouragement, and ultimately led him to step away from aerosol and begin to paint the street using other means. Looking back, Alexis still can’t believe how art changed his life. 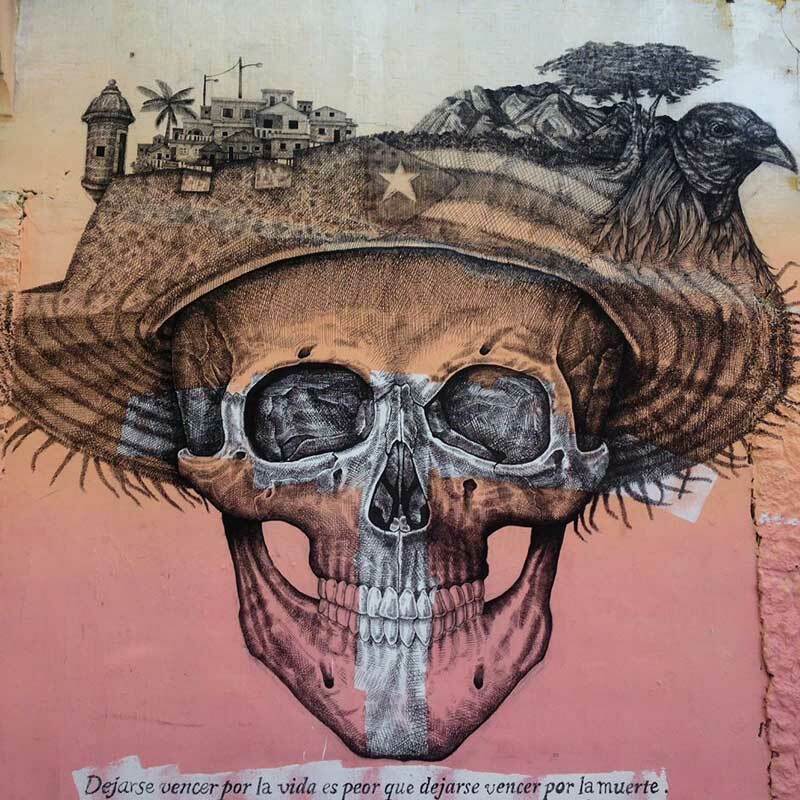 “I quit my job and everything I was doing at the moment and for a year and a half I painted the streets of Puerto Rico without gaining a penny,” he remembers. Now over 40 of his surreal murals can be found in more than two-dozen cities worldwide. And he keeps adding to the list: “This year I’ll be painting in New York, Budapest, Cozumel, Rome, Berlin, San Diego, Denver, Paris, and Sydney,” he says.